Holiday Homes in Dordogne France Les Gites Fleuris are 2 self-catering traditional stone Perigordian farm cottages perfect for a family holiday with heated swimming pool. Centrally located in Hautefort, near the majestic Chateau de Hautefort, the 2 vacation rentals are in the Perigord Region, sitting on a tranquil hilltop in the scenic French countryside. The holiday homes are located on a quiet semi-private lane, framed by acres of orchards, forests, and gardens, a real RETREAT, yet walking distance to boulangerie, grocery store, and all services! 5 out of 5 based on 24 ratings. 24 reviews. A Warm Welcome awaits you from your vacation rental owners: Renata & Larry Barnes! We are happy to help you plan every step of your family holiday in France! Read the reviews and comments from guests! Self-catering holiday homes, or gites, are fully equipped vacation rental houses: the Wisteria, a 3 bedroom holiday home perfect for families, and La Petite Rose, a romantic 1 bedroom cottage ideal for couples or small families. Both gites have been restored to preserve their traditional character while being fully updated with modern conveniences for your self-catering holiday. Our "all-inclusive" policies are listed on our rates page. Dordogne weather is perfect to enjoy the pool with sun deck and chairs, individual private outdoor dining terraces with barbecues, all have lovely views. The vacation rental property is family and child-friendly offering: a play area, swing set, raised fort with rock climbing wall, toys, ping-pong, badminton/volleyball, football nets, horseshoes, boules, croquet, hammocks, bicycles, and open space in the acreage and nearby forest to just wander and explore. An indoor recreation games room has billiards, ping-pong, toys, board games, and a TV with Disney videos for children. Self catering, gite, holidays are always more enjoyable for the family vacation when the local services are an easy stroll down a tranquil country lane to the local village: 1km to a boulangerie, a grocery store (with international foods, fresh fish and butcher), restaurants, medical center with doctors, and a bank. 2km to pharmacy, tabac/newsagent, post office, and the office of tourism; 2.5 km to a swimming and fishing lake. Dordogne has so many famous historic sites and Hautefort is the perfect location to explore from! The spectacular castle: "Chateau de Hautefort" is a 17th c Castle famous for its architecture and French and English gardens. Visit the "Musée de la Medicine" which depicts life in a 17th c Hospice.The region is dotted with 1001 castles, medieval villages, pre-historic sites, Cro-Magnon man cave art (Lascaux), grottes, troglodyte sites, bastille towns and abbeys. The area offers many sporting activities including: tennis, basketball, soccer, canoeing, kayaking, fishing, hot air ballooning, ropes par course in trees, and paintball. Bordeaux and the Bordeaux wine regions are easy drive away. Take a wine tasting tour of the areas: Saint Emilion, Paulliac, Saint Estephe, Margaux, Bergerac, and Monbazillac! Dordogne, Perigord, is renowned for the food: pate de foie gras, cepes, black truffles, canard, and cheese! After a day of touring the historic sites, your family vacation is complimented by enjoying the renowned food in the Perigord! There are many good restaurants in the area. Take the family to visit the local farms where they produce all of the delicacies renowned throughout France. Vegetarian options are available in the area- ask the owners to recommend the available in options the area! 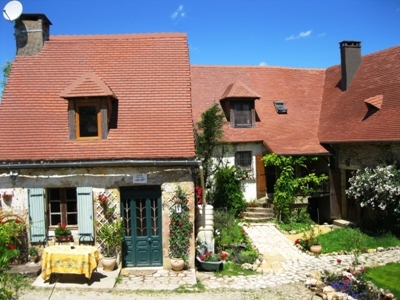 Les Gites Fleuris is a perfect vacation rental for the family holidays in France! Please visit lovetoescape for a great range of holiday accommodation including B&Bs in Rural France . Sie finden meine Ferienhäuser in Hautefort auch bei www.ferienwohnungen-ferienhaeuser-weltweit.de - Dordogne-Périgord. Article called us: "French Paradise" in the summer 2008 edition of Eldr Magazine!